As one of the most popular products that we offer here at Tuffa Tanks, the bunded steel tank is both versatile in its uses and is of the highest quality possible. As we design and manufacture all of our tanks in-house, we can guarantee a high standard like no other and deliver you the customer service you deserve at the same time. No matter what your need is, we can supply ready-made or bespoke bunded tank solutions for your business. We work with the most experienced and skilled steel workers and fabricators to ensure your Tuffa tank is the only one you will ever need. 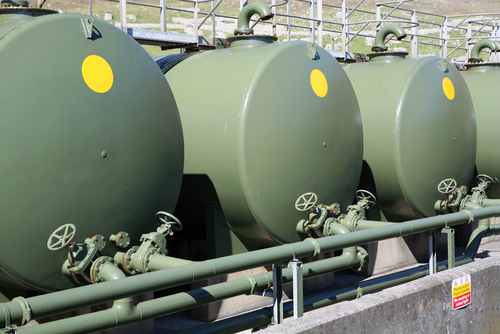 Why Choose Bunded Steel Tanks? The bunded steel tank is popular because it is one of the safest, securest ways of storing oil, diesel and other fuels, across a broad range of industries and sectors. What does bunded mean? Simply put, it is a tank that has an extra layer of security that is 110% the size of the original tank, to ensure any accidents or leaks are contained safely. In addition to that extra level of security; our tanks also minimise the risk of spillages, wastage and are cost-effective in the long term. Our bunded tanks are safe to store above or below ground and can withstand extreme weather conditions safely. Our bunded steel tanks are manufactured to adhere to tank regulations, to comply with Oil Storage Regulations and are available in a variety of capacities and colours to suit your needs. While bunded tanks are very popular in steel, we also manufacture steel and plastic combination tanks, as per your specific requirements. Who Uses Bunded Steel Tanks? There are many situations across a variety of industries that would require a bunded tank. Domestic uses include heating oil for the home, fuel and diesel storage for business, petrol stations, farms and airports; among many others. We have a range of fire protected tanks, too, that are extremely useful when the risk of fire is higher than normal. These bunded steel tanks are the best way to ensure that your tank is compliant with all building regulations. For more information on our range of bunded steel tanks, please visit our website, take a look at the tanks you require or contact our customer service team for any further assistance.